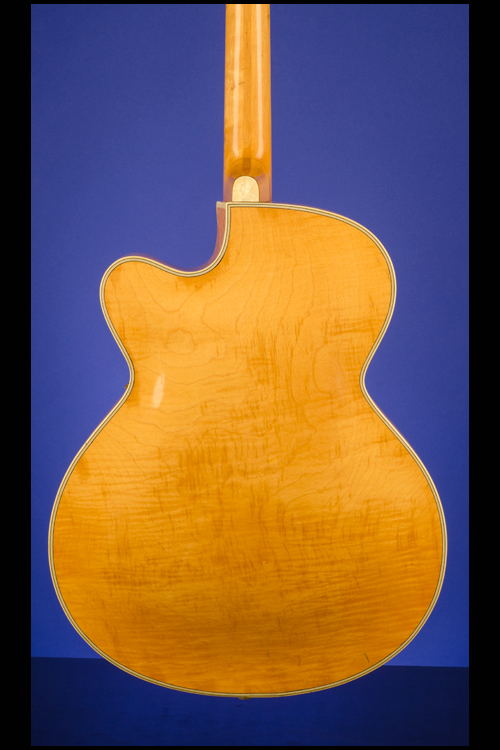 Model 45/S/E2b Guitars | Fretted Americana Inc. 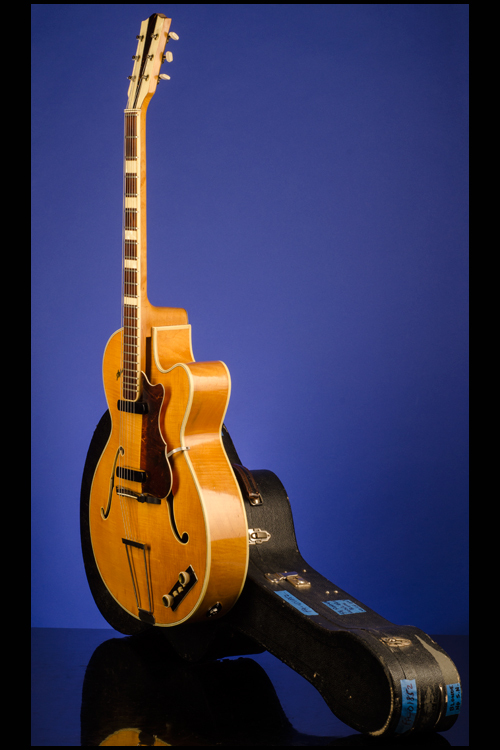 This 16-inch wide, just over 3 1/8 inch deep electric archtop weighs just 4.60 lbs. Two-piece book-matched, flamed maple top with "Höfner" decal in gold with black trim on bass side. One-piece flamed maple back and flamed maple sides. Two-piece lightly-flamed maple neck with a beech center strip, a nut width of 1 11/16 inches, a scale length of 25 inches and a wonderful thick profile. Single-bound 'slab' rosewood fretboard with 22 original jumbo frets and inlaid pearl block position markers. Six-ply binding on the top, six-ply-ply binding on the back and single-bound f-holes. 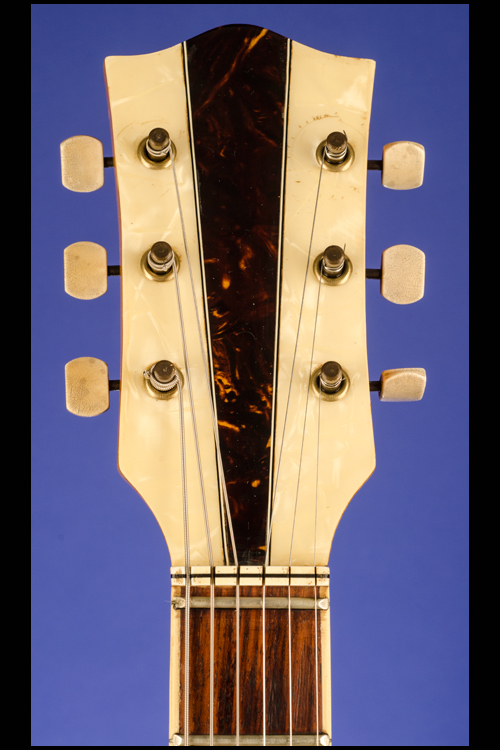 Headstock with mother-of-pearl and tortoiseshell face - the two separated by two sets of black and white lines. Two-layer pearloid over black plastic heel-cap with no strap button ever added. Single-layer tortoiseshell pickguard with white edging, secured by a single bracket and two pins. Three-in-a-line open back strip tuners tuners with round edge rectangular bone buttons. Two Hofner, height-adjustable single-coil black plastic pickups with outputs of 7.15k and 7.20k. Standard Hofner control panel with two volume controls and three two-way 'slider' switches for "Rhythm/Solo", "Bass" and "Treble". Hofner 'teacup' control knobs with ribbed sides and gold inserts on tops. Bone (single) saddle on height-adjustable ebony base and Hofner trapeze tailpiece. Inside the bass 'f' hole is a small rectangular gold label with "Musikhaus / Pauly / Viersen, Hauptstr.67" printed in black. The jack socket has been strengthened with a professionally fitted metal jack plate cover. The high 'E' tuner shaft is very slightly bent - but this does not affect the tuneability whatsoever. There are a few small and insignificant surface marks but overall, apart from the replaced larger jack plate this guitar is in 100% original exceptionally fine (9.00) condition. This guitar has never had, or needed a neck reset. Housed in the original five-latch shaped, black hardshell case with green felt lining, original leather handle included in case pocket (8.50). 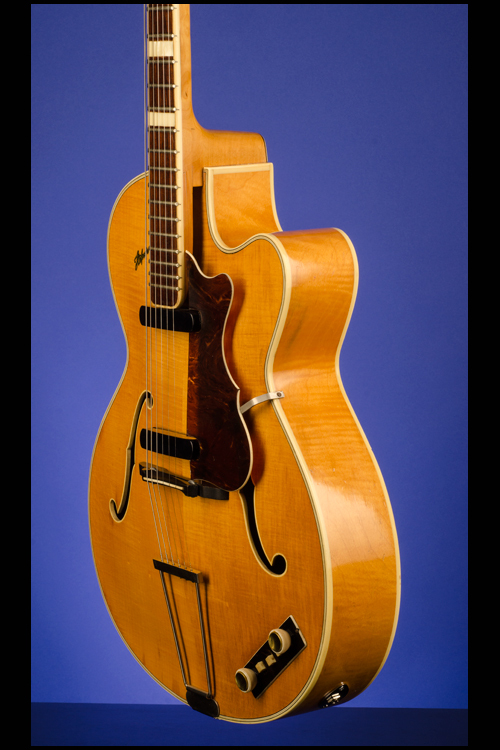 Although the archtop Hofners from this period were built without a truss-rod, this example has a perfectly straight neck with very low action and great playability. When Hofner re-commenced production in Moehrendorf, Bavaria after WW2, the 456 was one of the archtop models offered. 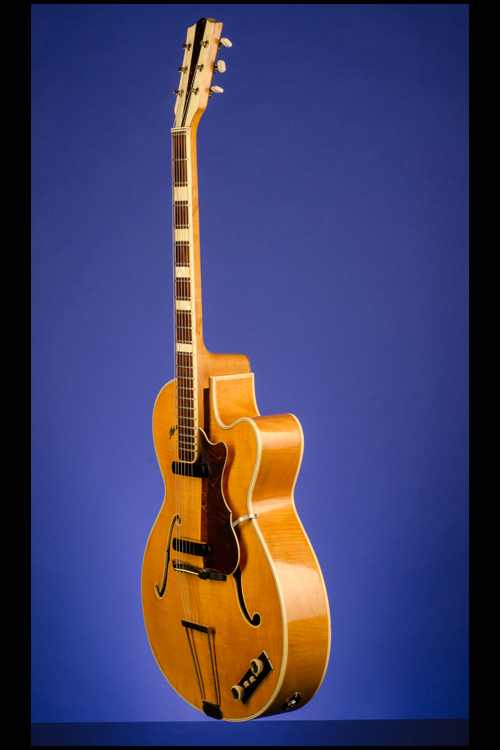 A very similar archtop had been produced with that model designation before the onset of the war when Hofner were based at Schoenbach in Bohemia. 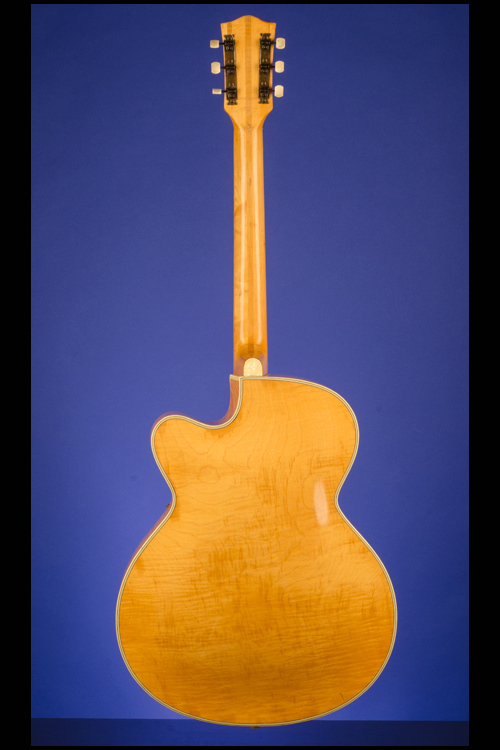 The 456 was intended to be Hofner's mid-range archtop, utilizing nicely flamed maple for the body back & sides, with a maple top. A good standard of ornamentation was used on the guitar, with binding/multi-purfling around body top, back edges and soundholes, with the rosewood neck also bound. 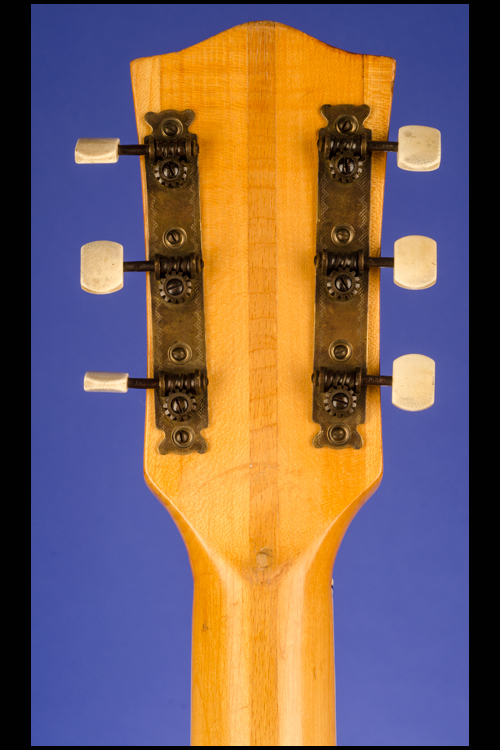 Pearloid strips were used for the fretmarkers, and on all but the very earliest guitars, a pearloid/tortoishell/pearloid celluloid fascia covered the front of the headstock. 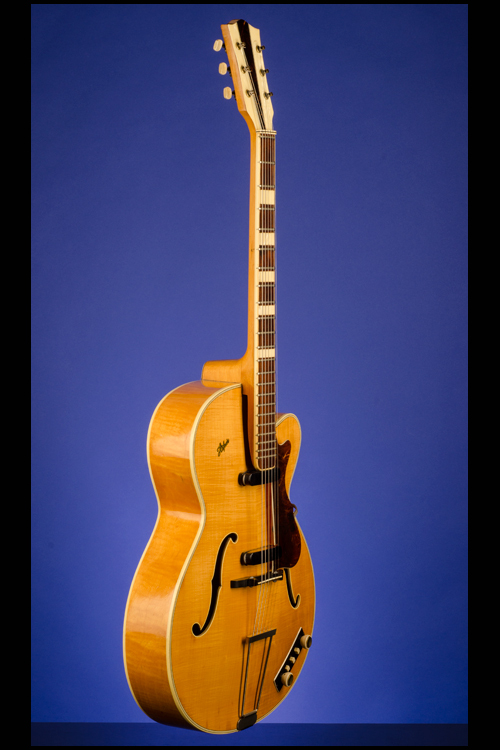 There can be problems differentiating between the 455, 456, and 457 models, particularly as Hofner seems to have continually revised the detail cosmetics of these models over the years. The main basic difference between the 456 and the slightly later 457 is that the 456 had a maple body top and the 457 had a spruce top. Both the 455 and the 456 had maple tops, but the ornamentation on the 456 was of a higher standard than the 455. For example, the 455 was not provided with binding to the neck initially, though later examples (after the demise of the 456) did gain this feature. Initially the 456 was only supplied in brown sunburst finish. Later, a natural blonde finish was available, and some examples even have a red-burst finish. 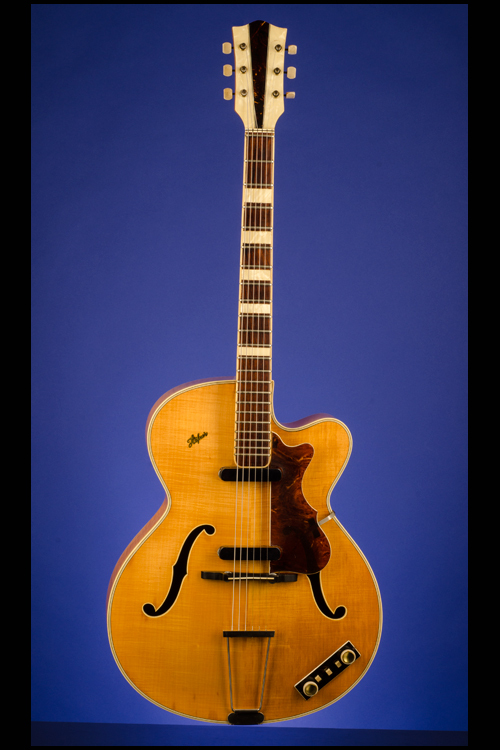 As with the rest of the Hofner range, the 456 was available from ca. 1954 with the option of factory fitted electrics. 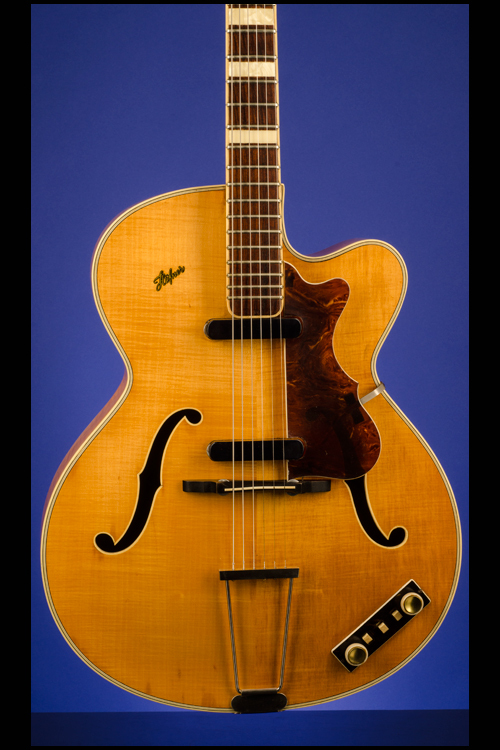 The 456 disappeared from the range in 1962, by which stage the 457 model would seem to have taken over as Hofner's principle mid-range archtop." (Source - The Hofner Website).